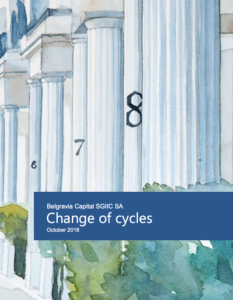 The investment team of Belgravia Capital have prepared a report with their vision of the economy and financial markets for 2019 entitled “Change of cycles”. As its name suggests, the opinion of Belgravia Capital managers, supported by both monetary and economic trends, is that we are in a change of cycles in Europe. In addition, the report analyzes the valuation of equities at this point in time. Finally, the report includes their view for the foreseeable future and explains the current positioning of Belgravia Capital portfolios. Investment universe: pan-european equities, varying market exposure and investing the balance in money market instruments only. Investment objective: annual returns of 4% to 6% (not guaranteed). Annualized volatility: lower than 8%. R2: less than 0.15 against the Stoxx 600. Investment objective: positive absolute return with a Sharpe Ratio higher than that of the STOXX 600. Volatility: lower than than 1.2 STOXX 600.